Journaling is an essential part of my creative process and lifestyle. I can jot down a character outline, keep track of books I want to read, or make note of healthy meal ideas. But my ability to carry only ONE notebook hinges on being able to manage my schedule, as well. 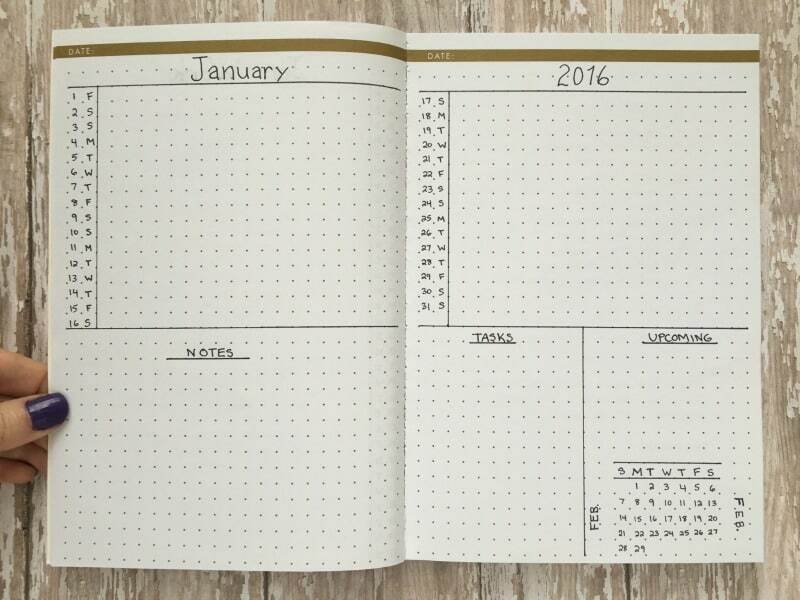 Monthly pages are an easy way to gather future planning events and tasks on a central spread for the whole month. From there, I migrate events and tasks to my weekly and daily pages. How you organize your monthly spread depends on your needs. How much of my time is dominated by meetings and appointments? Am I visually motivated or do I do well with sequential lists? How important is goal-setting to me? Which major tasks do I intend to track monthly? Keep the answers in mind as we work through some of these layout options. The original inspiration for my current monthly layout (pictured above) came from the lovely and talented Kara at bohoberry.com. I loved how she broke up the spread into columns, which makes scheduling multiple events on a given day much easier. I also added a column dedicated to my blog planning. It gives me a quick snapshot of ideas and posts I’m planning; from here, I can move things around and change post ideas as needed. Having my monthly goals on the page also gives me a metric to evaluate at the end of the month for how effectively I used my time. If you’ve visited my blog before, you know how much I love my Leuchtturm1917 notebook. I have an old dot grid journal from the clearance pile at Target ($2.98), and decided to keep it handy for trying out new layouts. It allows me to experiment a bit without burning through half the pages in my bullet journal. The quality isn’t great (the stiff binding drives me bonkers), but for less than $3, I really can’t complain. See my list of high-quality notebooks that hold up to bullet journaling. What works for me might not work for you, so I gathered up some of my favorite monthly layouts and developed a few of my own. If you’re new to bullet journaling, I encourage you to examine each layout critically in terms of your needs. 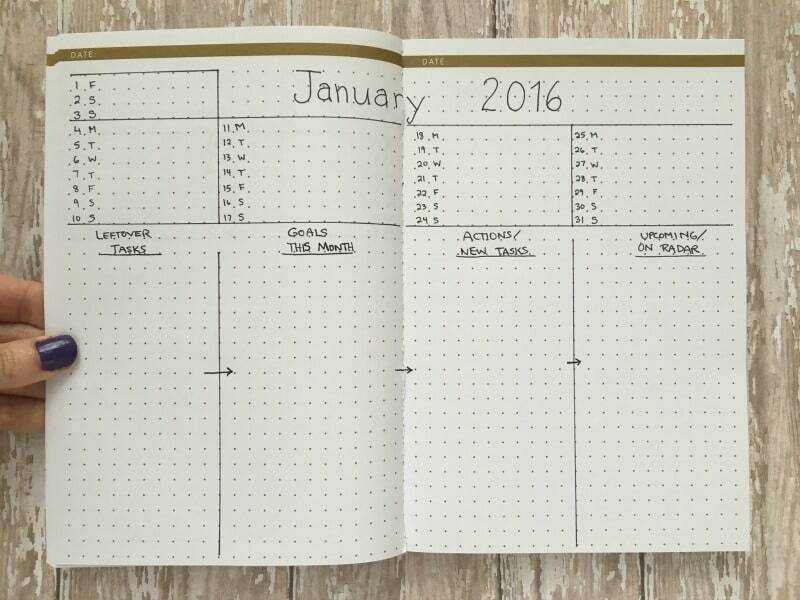 Ryder’s Bullet Journal system is clean, simple, and minimalist. 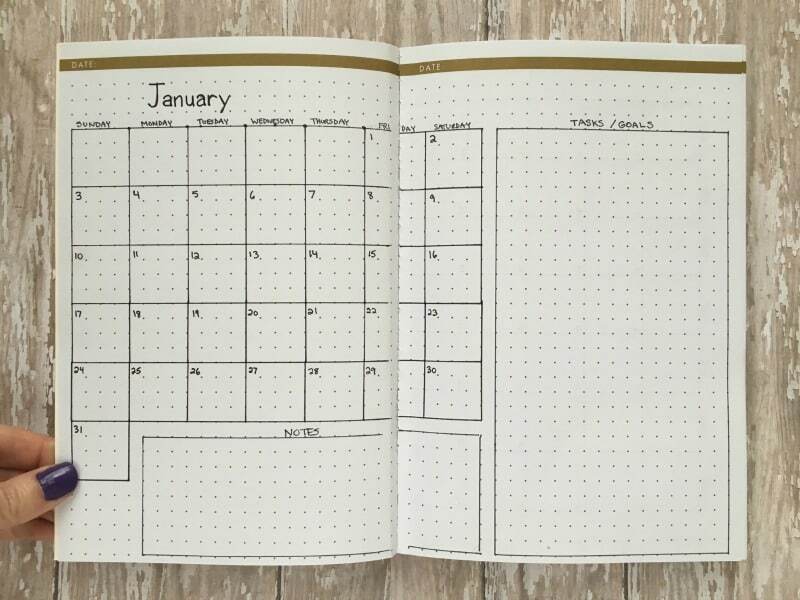 A monthly layout can be as simple as a header (the name of the month) and a numbered column, one for each day of the month. The “Ryder” is one of the quickest methods to set up your monthly log, and I would encourage you to give it a try before moving on to more elaborate formats. The “Basic Betty” is essentially the “Ryder” but with a few additional features. For starters, days of the week are added to the far left column to make scheduling a bit easier. The additional sections on the right page showcase the month’s actionable goals, and separate notes for people who need a little free thinking space. Rather than creating entirely separate journals for your personal and professional needs, the “Double Life” allows you to synch appointments from both worlds. This system deals strictly in appointments, meaning goals and task lists have to find a home elsewhere. 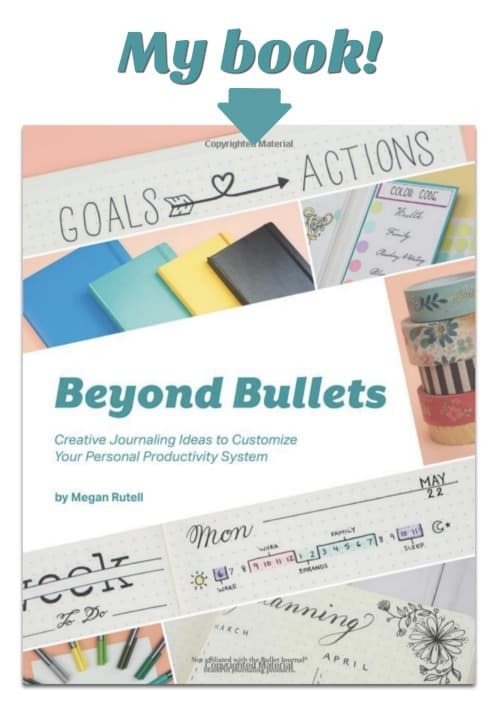 Check out how and why I use the bullet journal system. A month can be a lot to process all at once. If you like biting off a week at a time, the “Weekly Warrior” is for you. The right page organizes appointments and events, while the left page is left to prioritize major tasks on a weekly basis. Some people like a highly-structured layout where everything has its place. Others like a lot of free space for tasks and notes. The “Crop Top” suits both types of people. The top half of this spread neatly organizes scheduled events. 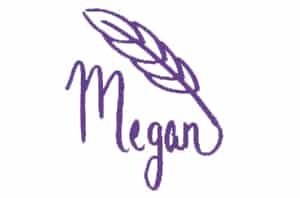 The bottom half can be customized to the user or left blank (for all you plan-by-the-seat-of-your-panters). Allows space for goals, notes, tasks, etc. The “Task Master” is for people of action. This layout emphasizes actionable goals and productivity like a task assembly line. Unaccomplished items from the previous month are listed in the far left column, followed by current goals and tasks based on those goals. The far right column gives a preview of upcoming projects. 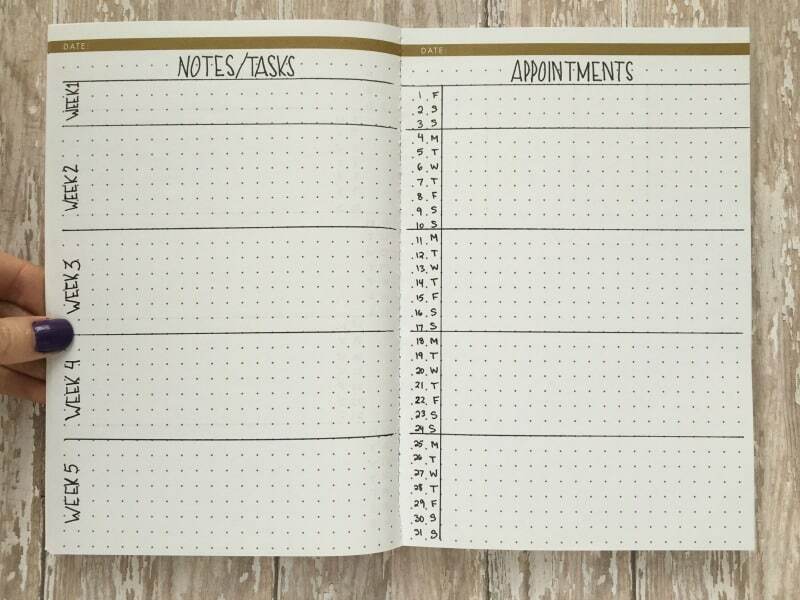 The monthly scheduling section is significantly smaller than other formats, so this layout should not be used by people with heavy appointment loads. 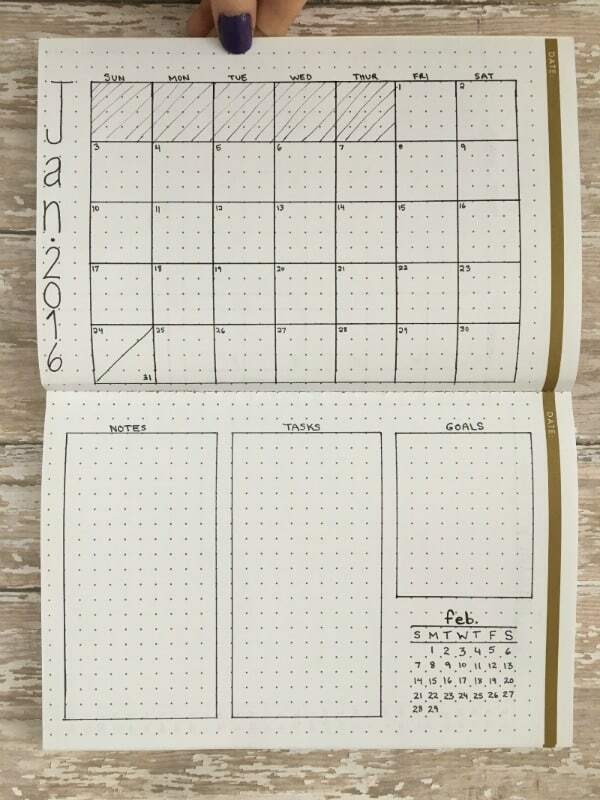 Now, we’re getting into the traditional calendar layouts. 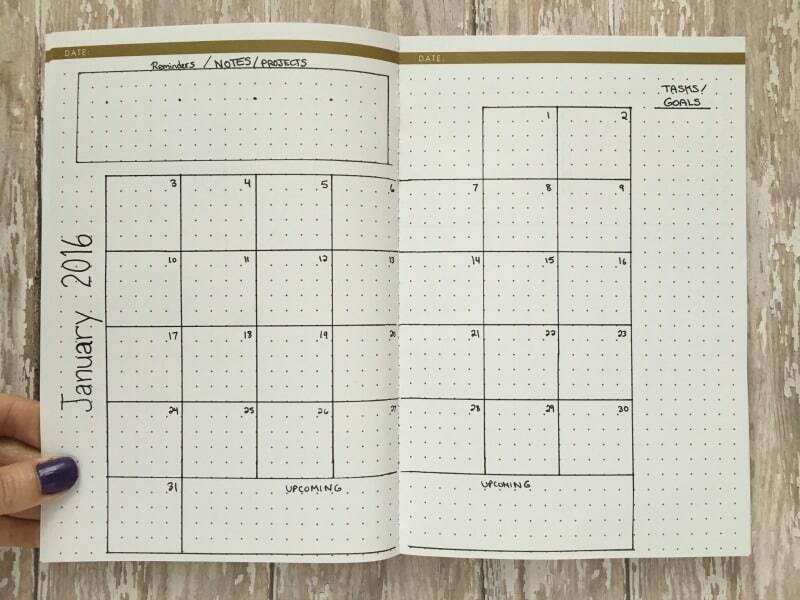 If you’re new to bullet journaling or have a hard time adapting to list-based scheduling, try drawing out a standard monthly calendar in your bullet journal. This is a nice format to use if you want your spouse or children to be able to read your schedule easily. 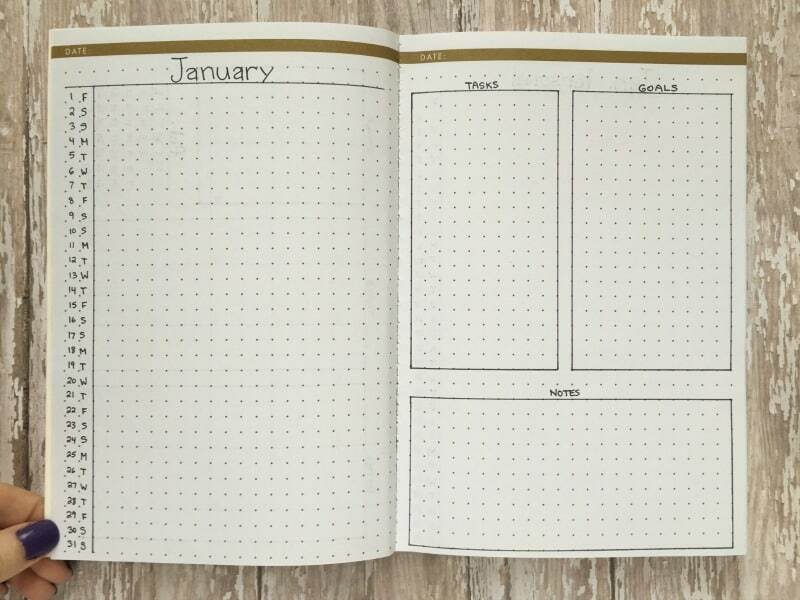 If you like a traditional calendar, but you need more room for goals, notes, tasks, etc., the “Mini Calendar” might be a good fit for you. More space for notes, tasks, goals, etc. The “Vertical Twist” solves that pesky problem of scheduling on the seam by turning the whole notebook on its side. The top page now has the ideal shape for a traditional calendar view, and the entire lower page can be used for note, task planning, goals, habit tracking, etc. 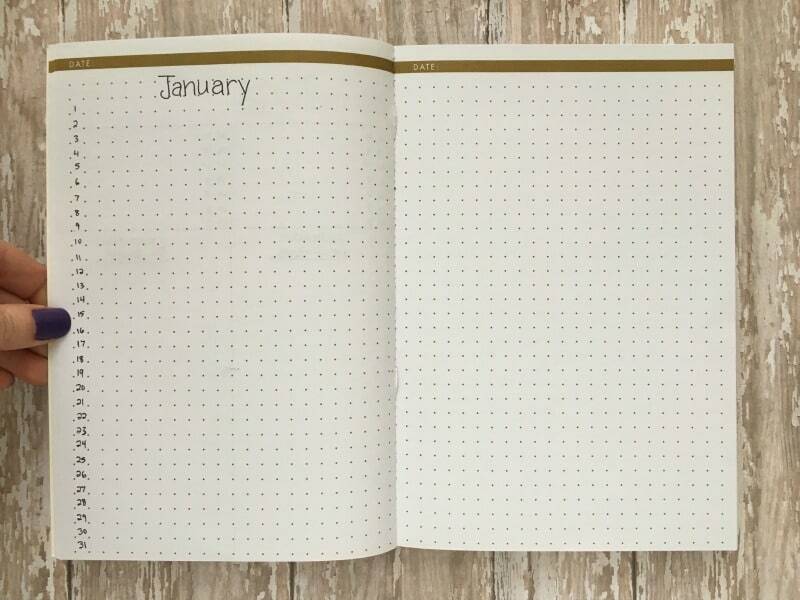 No more calendar on the seam of the notebook! Now, Make It Your Own! I can almost guarantee that your perfect monthly layout is not in this post. These are basic templates to get you pointed in the right direction, but each person’s needs are unique. Start somewhere. Adjust as needed! Which basic format do you use? Comment below & tell me about your planning system, or post a photo on my Facebook page! I am a newbie in bullet journaling and am excited to start! What size notebook are all these layouts drawn in? Hi, Melissa! My Leuchtturm1917(http://amzn.to/1VEw7o1) is an A5 size, which measures roughly 5.5 inches x 8 inches. Love these suggestions. I’m so happy that I found your blog. I’ve just found your blog, and read a few entries. I like the options and suggestions along with your candor. Thank you very much for sharing! I love your blog. I came over from IG but I can’t remember what hashtag led me to your profile. Your posts about BuJo make me want to try it again and the layouts above are great ideas. 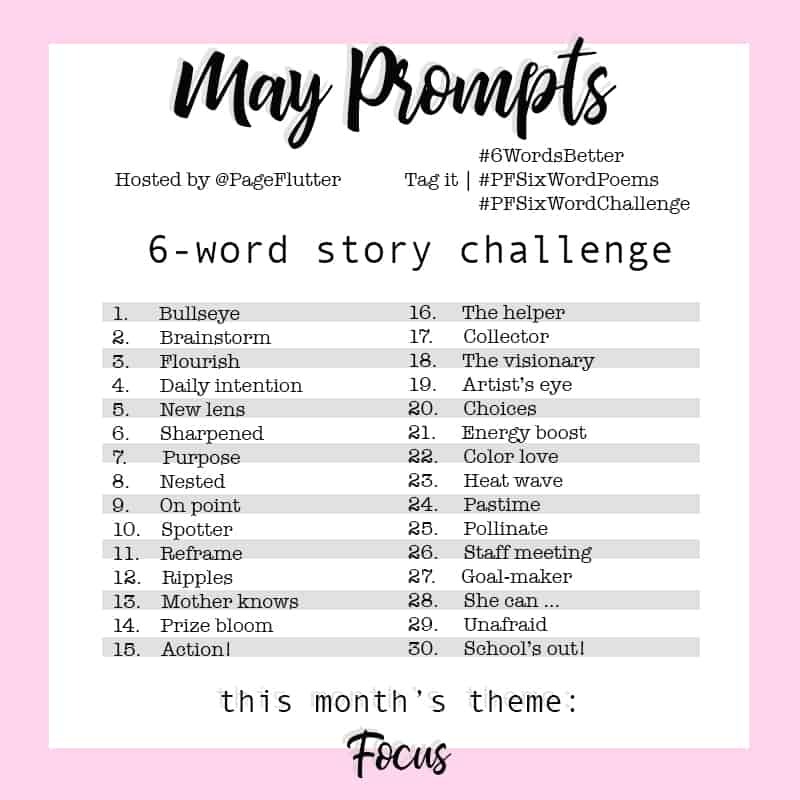 I’m also looking forward to trying the 6 Word Story Challenge. Hi, Jennifer! I’m so glad you found my blog. I love bullet journaling, but I know it can take some time to find the right balance. I hope you pick it up again, and I look forward to reading your six-word stories! Well done! Lots of useful ideas. I may try several over the next few months and see what I like best. Thanks!! I’m new to bullet journaling so still trying to figure out what works for me. Thank you for these layout ideas! Shelley, first of all, welcome to bullet journaling! I recommend starting very simply. 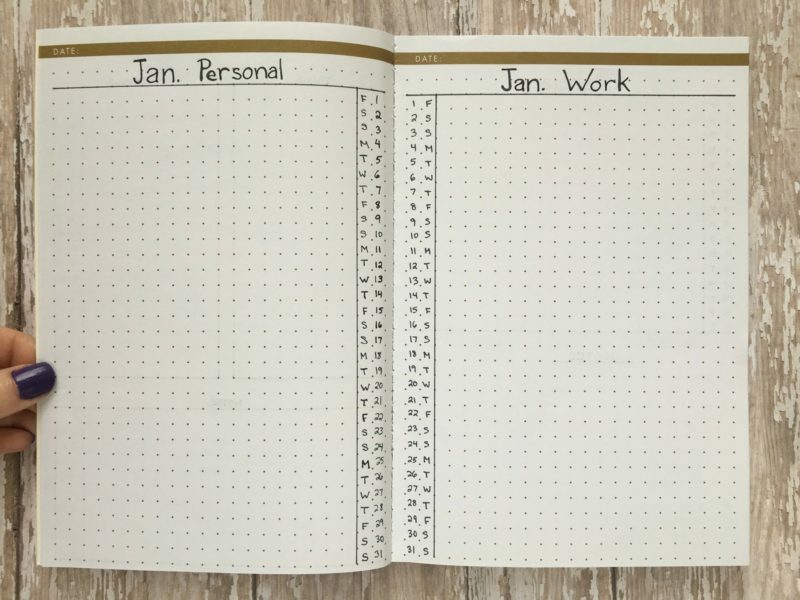 Limit your journal to your index, future planning spread, a simple monthly spread, and dailies. 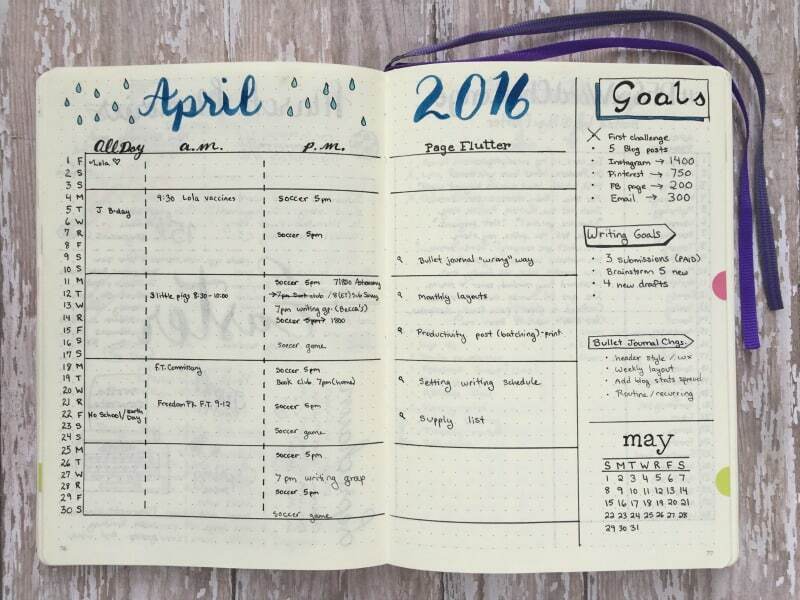 Do that for about a week to get a feel for the foundation of bullet journaling. Then–and only then–add a collection that suits your life (a list of books you want to read, a habit tracker, a budgeting page). Keep it very basic at first so you don’t overwhelm yourself. Over time you will be able to add more/change things needed. Hope that help! This is a great and comprehensive post. So many bullet journal posts are fluffy with limit substance. I really loved what you did here. Thank you so much for posting this! omg. the names of these layouts are slaying me! lol! Thanks, you’ve fuelled some ideas for me!